Reddit’s Programmer Humor community has come together for yet another baffoonish comedy showoff. Over the last week Programmer Humor members have been competing to come up with the best coder wisecracks they can – and the affair is shaping up to be a close contest. There is only one rule: Jokes have to be strictly developer witticisms. So forget about anything regular computer users would get and prepare for a shitstorm of obscure CSS, ARP and UDP gags. This is not the first time coder Redditors have engaged in a similar humorfest. A few weeks back Programmer Humor members took part in a week-long contest to design the shittiest possible volume slider. Needless to say, the entries did not disappoint. 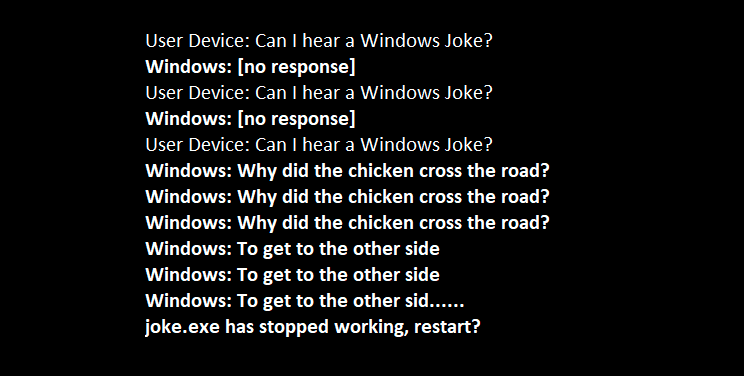 Got a winning joke you want to share with the rest of the bored devs on Programmer Humor? Head to this page to enter the competition.